Doyenne.sg uncovers comforting, authentic, home-cooked food from global cuisines in Singapore. Warungs are a main character in Indonesia’s food scene. A staple in street food culture, these street eateries serve up humble, delicious fare. 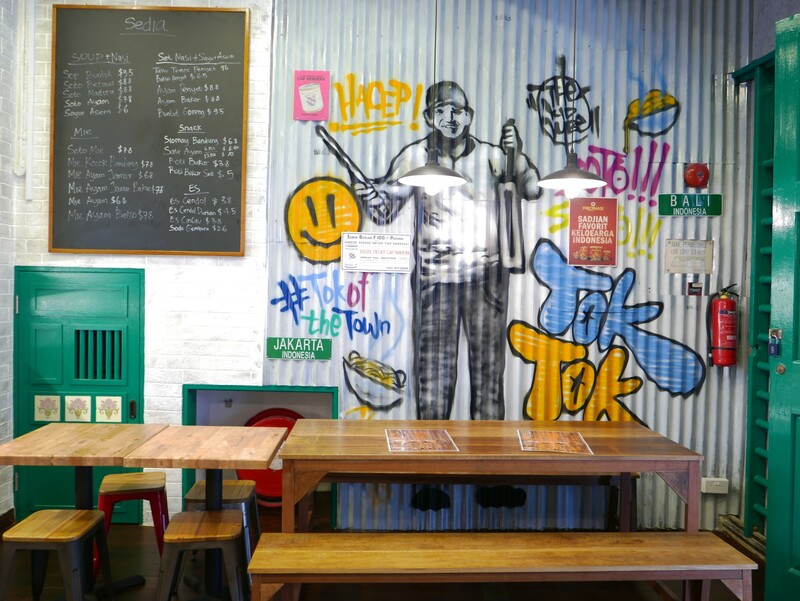 Named after the sound of a kentongan, the bamboo instrument warung hawkers use to attract customers, Tok Tok offers a version of the warung experience with regional dishes and traditional flavours. This satisfies those who crave authentic Indonesian cuisine. Authentic flavours are prioritised at Tok Tok, with most of the food prepared according to its Indonesian owner’s home recipes. Before taking the helm, Tok Tok’s Singaporean head chef went on a food tour around Indonesia, learning how each dish should taste in its original rendition. 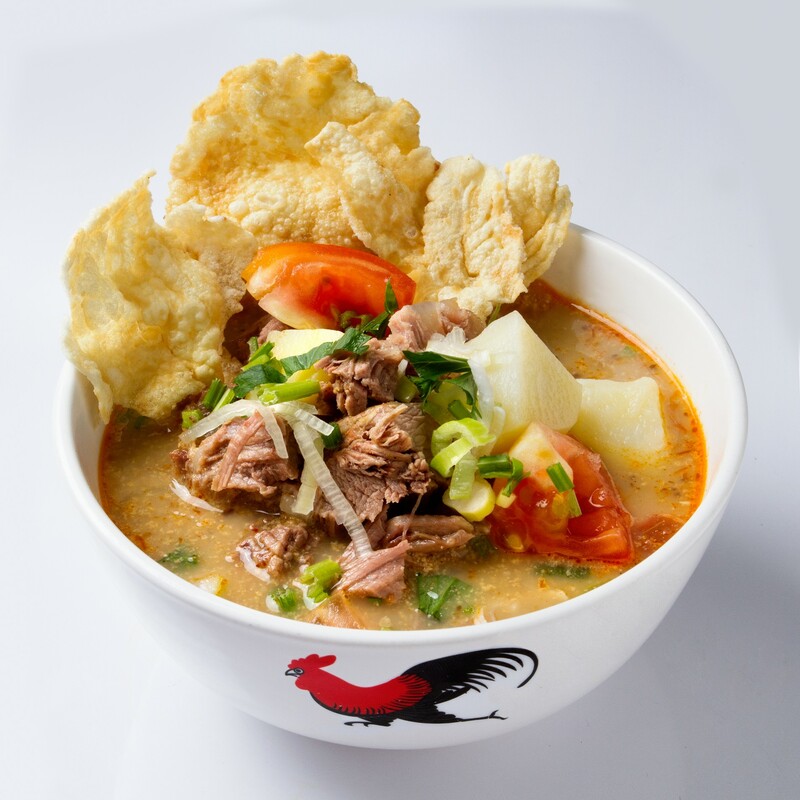 Soto betawi ($9.50). Jakarta’s signature beef soup comes with a dash of coconut milk, giving this hearty soup a rich and creamy flavour. As is typical in Indonesia, it is served with a side of rice and spicy sambal. Nasi campur Bali ($9.90). This dish is the best of Bali served up on a plate. 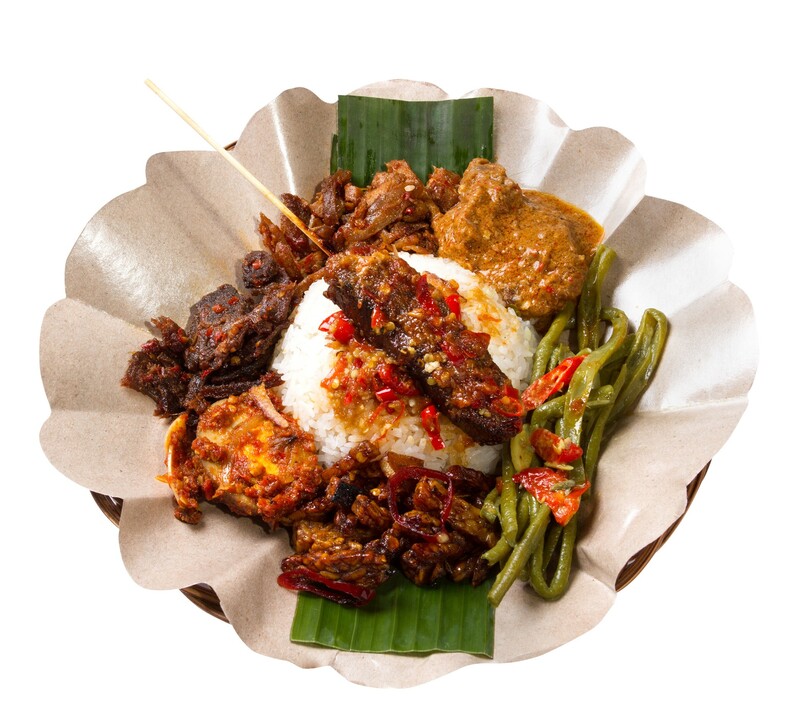 Savour Balinese-style beef rendang, sambal shredded chicken, sliced beef tossed with sambal, sweet and spicy fried tempeh, Balinese-style stir-fried long beans and beef skewers with basted homemade sambal. Voracious eaters will delight in this signature rice set that allows one to taste a little of a lot. Es Cendol ($3.80). 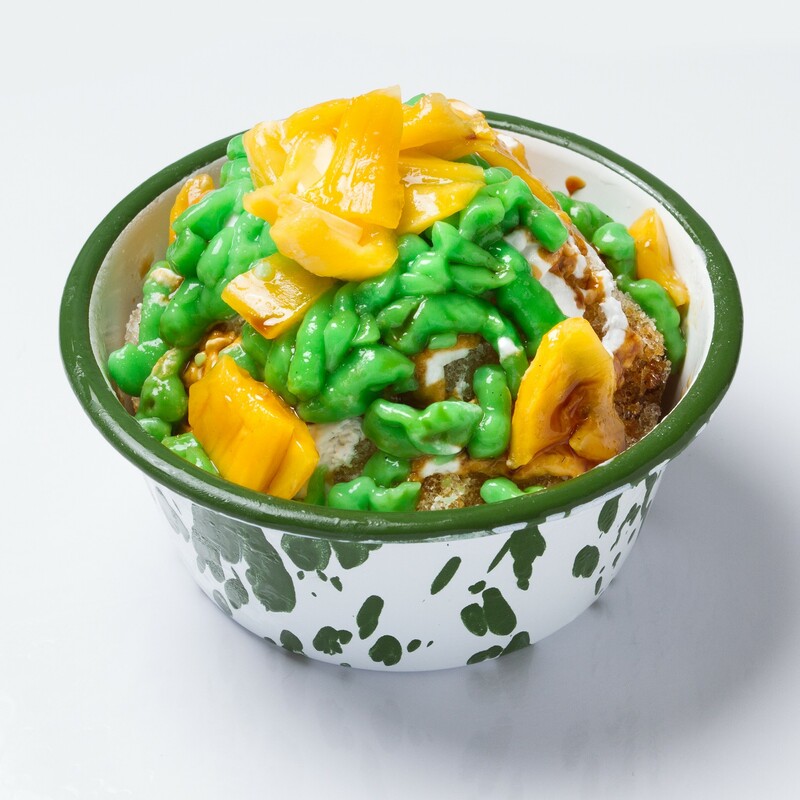 Pandan jelly, coconut cream and fresh jackfruit make a divine trio in Tok Tok’s version of this Southeast Asian sweet treat. Served atop finely shaved ice, it is a refreshing finish to a fine meal. Modern with a touch of nostalgia, Tok Tok’s traditions match Ann Siang neighbourhood’s trendy, eclectic vibes. A pastel pink-tiled entrance with vintage cafe doors beckons one into the casual eatery. Inside, bold graffiti art colours the walls. A covetable pop art painting, featuring Marilyn Monroe in a batik sarong kebaya with iPhone in hand, exudes a certain cheekiness. Take a seat at any table. If you need to, pull up extra chairs. A large chalkboard menu above the food counter announces the daily specials. Place your orders and indulge in conversation with your dining companions. An unmistakable “tok tok tok” will let you know that food is ready. Tok Tok is a dining experience best enjoyed with friends and family. Generous portions fill your stomachs, while sharing a meal with loved ones keep hearts full. 2 February is Crepe Day. Delicate and elegant, the crepe is widely celebrated in France. Despite the ubiquity of creperies in Paris, the humble crepe actually originated from Brittany, a northwestern region in France. To enjoy this delightful treat the way it is meant to be, Entre-Nous Creperie brings the classic French crepe back to its Brittany roots with traditional ingredients and cooking techniques. 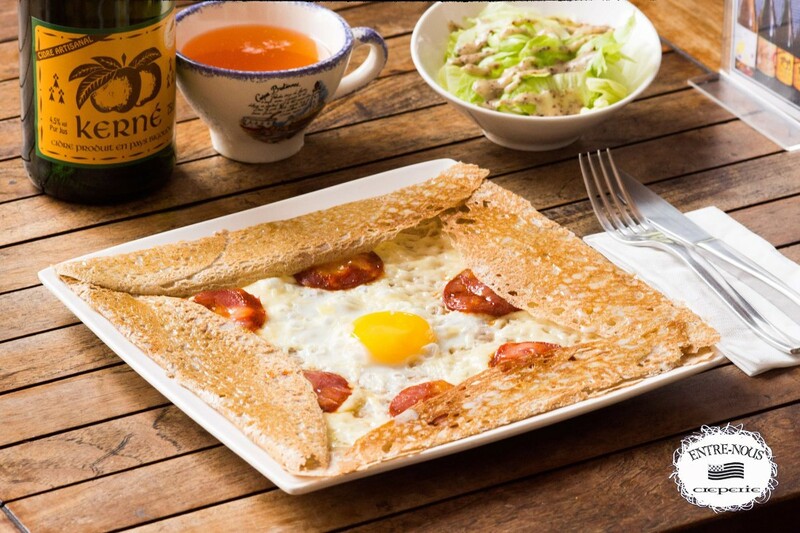 Run by a French couple, Entre-Nous dishes out sweet crepes and savoury galettes made from buckwheat and organic wheat flour. Each paper-thin crepe is cooked to perfection with salted baratte butter on specialised crepe pans from Brittany. The cherry on top of this pancake is a variety of homemade fillings and drizzles for customisation. Not sure which flavours go best together? Choose from tried and tested combinations on the menu. Stephan’s favourite ($14.90). 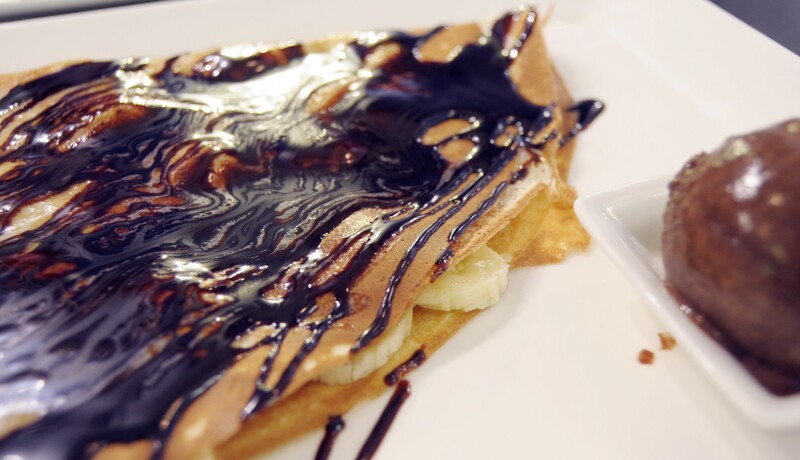 The banana crepe is enveloped in homemade chocolate sauce and ice cream. Light in texture and taste, the crepe goes well with rich cocoa drizzle and ice cream, without being cloying. Every heavenly bite into this sweet crepe is sure to satisfy. La brehat ($19.90). A crisp version of the crepe, this savoury galette is made from buckwheat flour. Gluten-free, it is cooked with French classics – an egg, emmental cheese and ham. Pair it with a glass of artisanal apple cider for a bubbly combo. 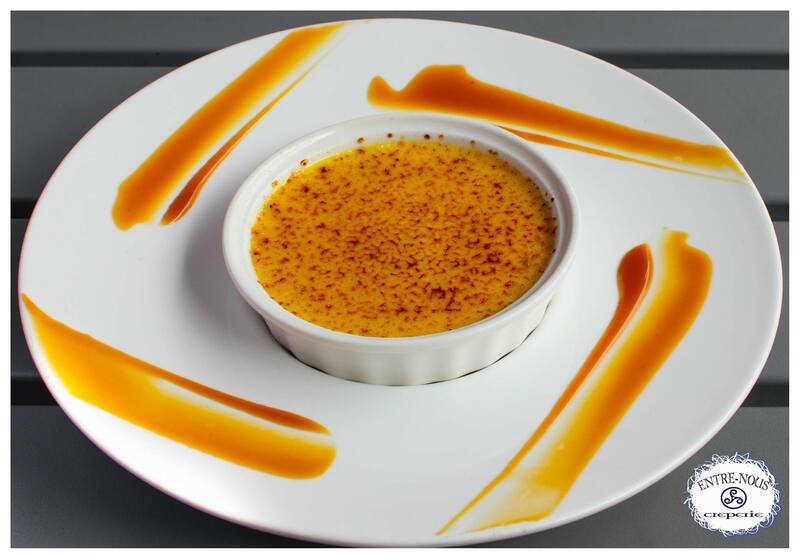 Creme brulee ($10.70). Entre-Nous’s version of this French classic dessert is infused with vanilla beans. Simply aromatic. From its cosy indoor seating area to alfresco dining space, Entre-Nous’ decor is simple with a touch of whimsy. Tables for two are the default. With warm lighting setting off a soft glow, calming blue-hued furnishings reflect the shimmering waters of Brittany’s rugged coastline, while nautical tchotchkes pay tribute to the region’s maritime heritage. This is a restaurant optimised for intimate dining. Located just across the iconic Raffles Hotel, Entre-Nous is perfect for a chic decadent brunch on a relaxing weekend morning. For a truly authentic French experience, dine alfresco for the ultimate vantage point and partake in a spot of people-watching. Caribbean cuisine is a delightful fusion of African, Amerindian and European culinary influences. Besides the blend of tangy spices and aromatic herbs that dance on the tongue, a lime is a must-have to get a truly quintessential Caribbean dining experience. Here, ‘lime’ refers to the Trinidadian slang of hanging out with friends. It is exactly this Caribbean concept of relaxed social dining that Lime House wants to showcase in Singapore. In Lime House, the essence of the Caribbean is mainly represented by Trinidad and Tobago and Jamaica – countries whose foods feature heavily in the menu. Trinidadian comfort food make an appearance in an elevated form, while Jamaica’s famous jerk is featured in a number of dishes. In line with its concept of social dining, food at Lime House is served for liming – tapas-style or in generous sharing plates. Doubles ($13.00). 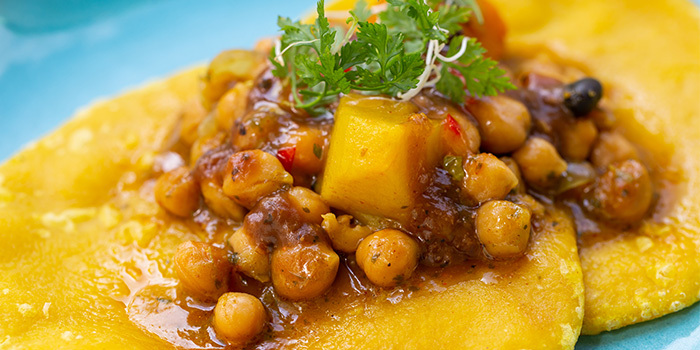 A Trinidadian street staple, these fluffy flatbread rounds come with curried chickpeas, tamarind and mango chutney, tapas style. Mac balls ($14.00). 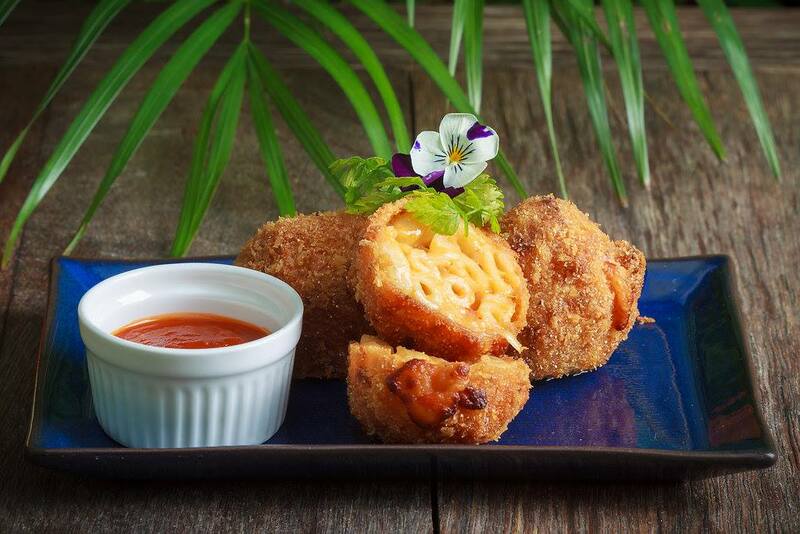 Another Trinidadian favourite, the macaroni pie is reinterpreted as cheesy homemade macaroni balls with Caribbean dipping sauce. Jerk chicken skewers ($22.00). Char-grilled jerk marinated chicken tenders are cooked to perfection with spicy jerk seasoning, a fiery combo of peppers and spices like scotch bonnets, nutmeg and pimentos. 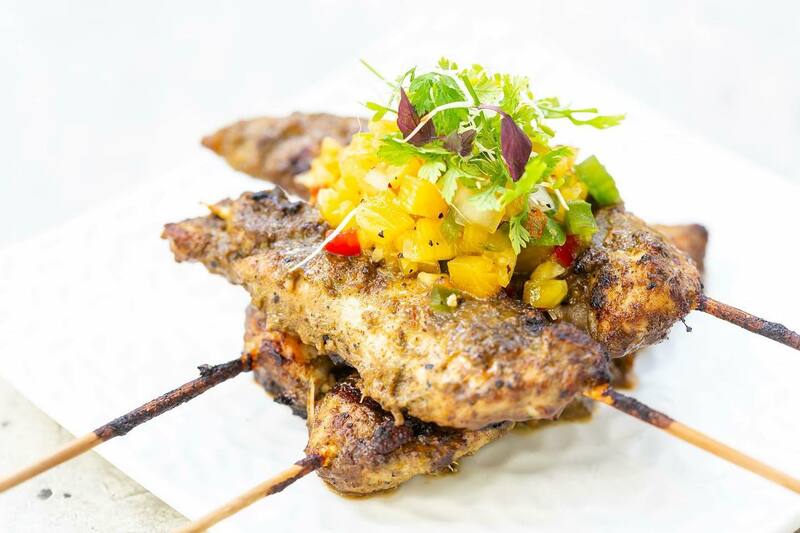 Served in individual skewers, Jamaican jerk chicken also come in the form of meatballs and large portions for sharing. Rum (from $16.00). Savour fine rum from over 150 international distilleries in Bago, Lime House’s rum bar designed to look like your living room. 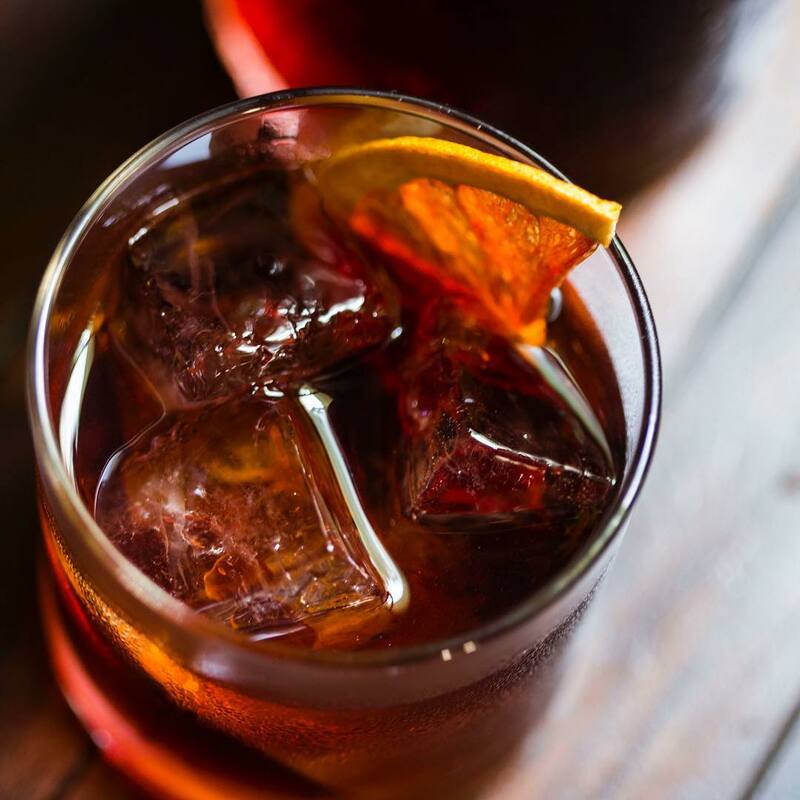 An ode to the Caribbean spirit, rum is also imbibed in refreshing cocktails and infusions. Housed in a three-storey heritage shophouse, Lime House is a curious juxtaposition of the Caribbean and Asia. 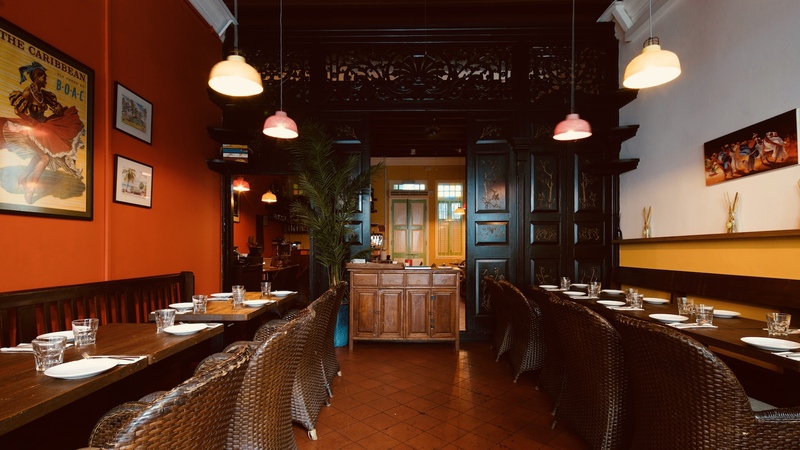 Heavy wooden doors frame vibrant walls adorned with Caribbean-inspired artwork in Lime House’s main dining room. Concept-wise, Lime House is designed to look homey. This urges diners to get into the spirit of liming. Rattan chairs and beach-inspired soft furnishings coax patrons to get as comfortable as they want. Easy listening melodies and low tempo beats complete the laid-back feels. It is time to lime. Good food, plum rum and chill beach vibes, Lime House is best for unwinding with friends and recharging for the week ahead.